At All American Carpet & Tile, we treat flooding and water damage as an emergency situation. Technicians can arrive at the home within an hour of contact. Representatives are also available over the phone to assist clients with steps to reduce water damage. If the flood is caused by plumbing problems, you will need to shut off the water source. This could mean shutting off the water for an entire house or building. You may also need to remove water from the affected area using a bucket. The major risk associated with water damage is mold growth. In order to reduce the risk of being infected with mold spores, flood maintenance must begin within 48 hours of the incident. Mold spores can settle and grow within five days of contamination from flooding. Mold can grow in carpets, on tile and hardwood flooring, on furniture, even in flooded drywall. Mold can cause allergies and other serious respiratory problems, and in some cases, death. Another minor risk associated with flooding is damage to the function or quality or carpets, furniture, decor, and other household items due to exposure to moisture. To prevent molding and other property damage our technicians inspect the flooded area and affected furniture. This may include moisture detection in other areas of the home, office, or building. Next, they extract all of the remaining water using a high-powered vacuum. They also contain dust or any other contaminants that have been knocked loose during the flood. We have carpet and furniture drying services available to those who need it. Mold remediation services are also available. These both help to dehumidify rooms that have been affected by the flood. The fans keep fresh air circulating to prevent mold from settling on surfaces in the home. After the flood is contained, the carpet may need to be cleaned. Our step-by-cleaning process includes thorough inspection, treatment of stains, a deep cleaning with debris removal, speed-drying, and a follow-up inspection. 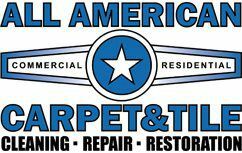 Contact All American Carpet & Tile for more information on our emergency flood services.